Hillary Clinton won 66% of Latino voters on Election Day, according to updated National Election Pool exit poll data, a level of Democratic support similar to 2008, when 67% of Hispanics backed Barack Obama. However, Clinton’s share of the Latino vote was lower than in 2012, when 71% of Latinos voted to re-elect Obama. On immigration issues, 68% of Hispanic voters opposed building a wall along the entire U.S. border with Mexico, compared with 46% of whites and 82% of blacks, according to NBC News exit polls. When asked about unauthorized immigrants, 78% of Hispanic voters said they should be offered a chance to apply for legal status, compared with 67% of whites and 82% of blacks. Overall, 46% of Hispanics cited the economy as the most important issue facing the country, followed by terrorism (20%), immigration (19%) and foreign policy (11%). Some pre-election polls found levels of Latino support for Clinton that were similar to the ones that the national exit poll showed. 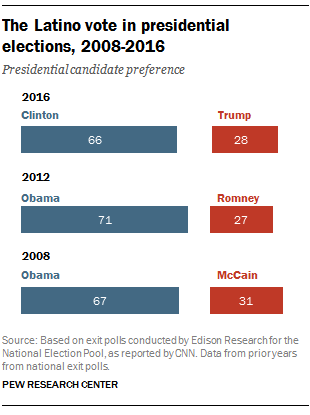 However, most pre-election polls found lower Latino support for Trump than the exit polls did. For example, 19% of Latino registered voters backed Trump in Pew Research Center’s fall National Survey of Latinos. Turnout aside, a record 27.3 million of Latinos were eligible to vote in 2016, up 4 million from four years ago – the largest increase of any racial or ethnic group. And the Latino electorate grew in many states since 2012, including the battlegrounds of Arizona, Florida and Nevada. Note: This analysis was originally published Nov. 9 and has been updated. It reflects data for 2016 as published by NBCNews.com and/or CNN.com as of 12 p.m. on Nov. 29. If data are subsequently re-weighted by the National Election Pool (NEP), the consortium of news organizations that conducts the exit polls, the numbers reported here may differ slightly from figures accessible through the websites of NEP member organizations.